Engineered for elite performance, the Men’s Hurricane Wetsuit Cat 5 Sleeveless utilizes a slew of advanced features to provide optimum stability, maximized speed and energy efficiency in the water. Each and every HCSVM6A wetsuit also includes elevation panels, quick release ankle cuffs, an innovative antimicrobial lining and state-of-the-art range of motion zones. 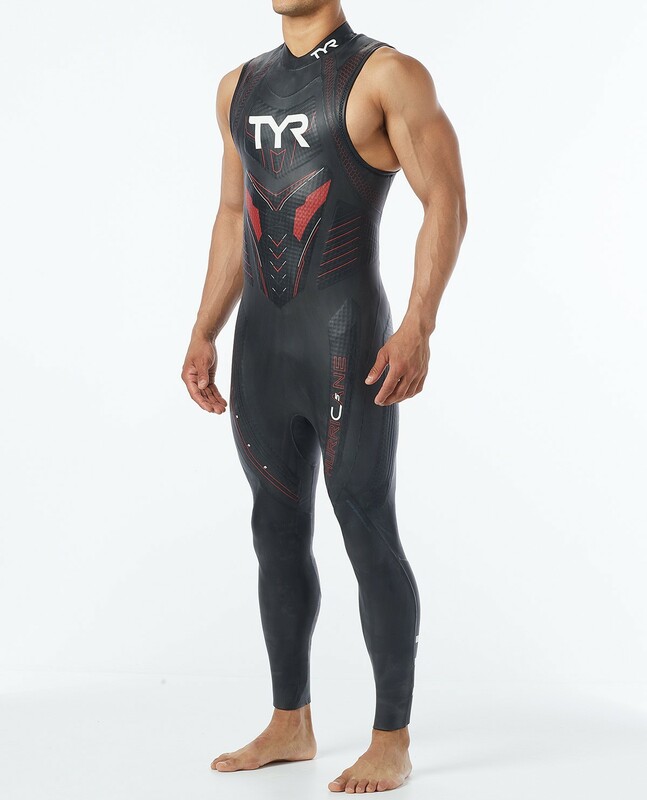 I've used TYR products for 20 years, but this was my first wetsuit purchase. If you are looking for a top-tier triathlon wetsuit, you will not be disappointed. Everything exceeded my expectation, from packaging/shipping experience (I purchased direct from TYR), to fit, to performance in practice and race settings. My first time wearing a suit and I was nervous at first but once I put this on and tested in the pool I felt that I was cheating and this suit was not allowed to race in open water.. This suit is fast and very comfortable. Placement of the panels to allow the amazing buoyancy is perfect.. I will for sure get the full sleeve suit..
Q: Does it keep warm in cold water ? What is the lowest temperature this wetsuit can stand ? A: We do not recommend swimming in any TRI wetsuit below 55 degrees Fahrenheit as it is the lowest possible temperature for a TRI race. You also may want to consider sleeves, for colder waters. Q: Any chance Tyr will offer a blue-black option for this suit in the future? A: Thank you for your inquiry. Our Men's Hurricane Wetsuit Cat 5 Sleeveless will not be offered in the blue-black color ways, this season. Q: What do you do with the zipper cord when the suit is on? A: Thank you for your inquiry. Most triathletes will tuck the cord in the suit when in the water. Q: I have the new Cat 5 sleeveless men's wetsuit. From the pictures on your website it looks like there's a place for the Velcro on the end of the zipper cord to attach to the base of the zipper liner. My suit has the Velcro on the end of the cord, but I don't see where to attach it at the base of the zipper liner - there's nothing there to fasten it to. So my cord is just dangling. Can you explain? Thanks! A: Thank you for your inquiry. The Velcro was removed from the re-designed Hurricane Wetsuits because most triathletes were tucking the cord in water. When tucked however, swimmers were reporting that the Velcro was irritating the skin.